About 65 truck drivers who haul goods to and from the Los Angeles-Long Beach port complex have reached a landmark agreement with Australian logistics company Toll Group on a contract that gives drivers significant pay raises and benefits. The drivers, who were previously independent contractors that were paid by the load hauled, unionized under the Teamsters in April 2012. Under the new contract, which was agreed to Jan. 9, they will see their day shift hourly rate increased from $12.72 to $19 and their night shift hourly rate jump from $13.22 to $19.75. In addition to the immediate raises, drivers also won 50-cent-per-hour annual raises over the life of the contract, giving Toll port drivers hourly wage boosts of more than 60 percent over the life of the three-year contract. The first-ever contract also shifts a bulk of drivers’ health care costs to their employer, grants overtime, paid sick leave and holidays, offers guaranteed hours and a pension plan. Overtime pay of time-and-half kicks in after drivers work a 40-hour week. According to the truckers, an average workweek for them is currently around 60 hours. As Teamster Local 848 members, the drivers have been automatically enrolled in the union’s Western Conference Pension Trust. Toll Group will make a pension contribution of $1 an hour per driver until 2014, and a $1.50 an hour per driver by 2015. “This new agreement shows that international solidarity between workers does make a real difference and that when workers stand together they can win real change that will lead to improved standards across the trucking industry,” Kaine said. The Port of Portland Commission has approved a temporary incentive plan to boost business at its struggling Terminal 6 facility. Under the plan, which was approved on a 7-2 vote Jan. 9, a $10 per container subsidy will be given to carriers calling at the facility, with the amount to be doled out capped at $1 million. The money will come from rental payments made to the port by terminal operator ICTSI. “This program is justified as a means of helping sustain the mission critical nature of the container franchise to shippers in the State of Oregon and throughout the region,” according to the port’s general manager of marine business development, Sebastian Degens. Terminal 6 experienced substantial decreases in both vessel and gate productivity beginning in early June 2012, something the port blames on a labor dispute over jurisdiction over the hooking and unhooking of refrigerated containers. Although the National Labor Relations Board eventually ruled that the International Brotherhood of Electrical Workers employees should perform the disputed work, not International Longshore and Warehouse Union employees, the port says that decreased and inconsistent terminal labor productivity has continued and added considerable additional expense for ICTSI and ultimately for the carriers calling at Terminal 6. While parties do believe that the labor issues and accompanying terminal productivity levels will eventually improve, that does not appear likely in the short term, according to Degens. The port now says the per-container incentive is needed to help facilitate implementation of long-term terminal use agreements. Under the action approved by the commission, the incentive expires at the end of 2013. Pacific Distribution Services, a Sumner, Washington-based regional warehousing and transportation provider serving the ports of Seattle and Tacoma, announced Jan. 8 that it has been bought by Port Logistics Group, a Houston, Texas gateway logistics services company. Pacific Distribution provided warehousing, distribution, transportation and logistics services for more than 60 years to customers in the Seattle/Tacoma port region. Its client base of national retailers and retail manufacturers includes companies in the apparel, footwear, housewares, furniture and coffee business. Former Pacific Distribution President and Owner Dale Scott will continue with Port Logistics in the new role of general manager of the Seattle/Tacoma gateway. “We believe this change is very positive for our customers, as we can combine the personal service and local knowledge they’ve come to expect with the size, scope and national footprint of Port Logistics Group,” he said. With the addition of Pacific Distribution’s more than 600,000 square feet of distribution space in Washington, Port Logistics Group now operates over four million square feet of distribution space in key gateway locations across the US, according to the company. Health officials in Canada have sent a letter to Port Metro Vancouver stating that they wish to have input into the port’s expansion plans, including a proposed new coal terminal. The letter brings up the issue of the potential of air and noise pollution caused by expansion projects. “Rail and road traffic produce air emissions, noise and risk of injury, as well as livability concerns,” the letter, which is dated Dec. 17 and signed by Vancouver Coastal Health Chief Medical Officer Dr. Patricia Daly and Dr. Paul van Buynder, vice-president of public health at the Fraser Health Authority, states. The letter comes as Metro Vancouver is in the process of reviewing a project permit application by Fraser Surrey Docks to develop a direct transfer coal facility that would export coal from the US Midwest to Asia. It would handle up to four million metric tons of coal annually. A campaign is in progress by environmentalists and public health advocates to block the facility, however. Although the port has worked in the past with health officials on noise and air quality issues, it has so far been noncommittal regarding the health officials’ request. At press time, judging by the 3,000-year-old Mayan calendar, the end of the world was fast approaching. If you’re reading this, the world is still turning (although the accuracy of a calendar developed three thousand years ago that has an accuracy of plus or minus 750 days doesn’t preclude the event from happening next month). One impending event that is guaranteed is the appointment of a successor to fill a vacancy on the Seattle Port Commission created when Commissioner Gael Tarleton resigns from the Port Commission at the end of this month. At the last election, Tarleton was elected to represent the 36th legislative district in the Washington State House of Representatives. Under State law, the Commission will have 90 days to appoint a successor, and the decision will be taken by majority vote at a Commission meeting. Tarleton’s successor will serve until the November 2013 general election, when a candidate will be elected to complete her term that expires on Dec. 31, 2015. The Port of Seattle Commission has announced the proposed schedule for the process, which gives applicants until noon on February 1st to submit application materials. On February 4th, 20 finalists will be named, and they will be asked to address the Commissioners for two minutes at the February 5th Commission meeting, or submit a written statement. By February 12th, the Commission will have narrowed the finalists down to 6, and the commission will appoint the new commissioner in March at one of the scheduled public Commission meetings. While this commissioner will only serve until the election in November, a temporary commissioner who proves his (or her) competence during this interim and seeks to run for the remainder of the term will effectively be an incumbent with a decided advantage over the competition. Gael Tarleton has been a friend of the maritime industry during her tenure on the Seattle Port Commission, and we wish her well in her future endeavors representing the 36th district. It is the hope of Pacific Maritime Magazine that her replacement on the Commission be as engaged and interested in the continued success of the local and West Coast maritime community. The Port of Seattle operates the Airport as well as the seaport, and is partially funded by taxes collected from voters in King County. A replacement for Tarleton who respects the contributions of the maritime community is not assured, and it’s entirely possible that someone with little or no knowledge of the industry could be considered. 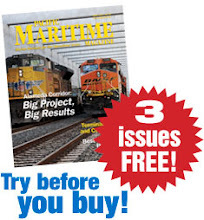 The West Coast community has a rare opportunity to affect the election of the next commissioner, and it goes without saying that one of the 8,000-plus subscribers to Pacific Maritime Magazine is, or knows, a perfect fit for this position. If the world didn’t end last month, more information on the Seattle Port Commission opening can be found at www.portseattle.org/about/commission/pages/default.aspx. The Port of Long Beach Board of Harbor Commissioners has temporarily put off voting on the full budget for a $1.2 billion plan to renovate two aging shipping terminals, saying that more time is needed for review. During its Jan. 7 meeting, the board agreed to place the vote on hold pending further review of the Middle Harbor redevelopment project by commissioners, stakeholders and the public. A workshop has been tentatively set for Jan. 22, with the time still to be determined. The Middle Harbor redevelopment plan consists of the combining of two aging shipping terminals, Pier E and Pier F, into one modern terminal for the purpose of improving cargo-movement efficiency and reduction of environmental hazards. According to the port, the project upgrades wharfs, water access and storage area; as well as add a greatly expanded on-dock rail yard. Despite the lack of final budget approval, work on the nine year project began in the spring of 2011; since then, the port has been upgrading the area’s wharfs, water access and storage area, plus expanding on-dock rail. On April 3, 2012, Orient Overseas Container Line signed a 40-year, $4.6 billion lease with the port to operate the 300-acre terminal along with its subsidiary, Long Beach Container Terminal. LBCT has occupied Pier F since 1986.